I frequently post my meals on Instagram and so far this has been the one that has garnished the most attention. I have friends, family and even strangers asking for the recipe. I got some inspiration from Pinterest and used a pepper as a nacho. This cuts calories and carbs and packs a huge punch of Vitamin C. You can top it with whatever you desire, I’ve certainly played around with it. My favourite will always be crockpot Mexican chicken. Take boneless, skinless chicken breasts and place them into your crockpot. Pour in a bottle of mild salsa and a can of fat-free refried beans. Make a mixture of low-sodium taco seasoning, garlic powder, chili powder, onion powder, red pepper flakes and lime powder. Sprinkle it over top of everything and then stir. Let cook for 6-8 hours and then shred the chicken with two forks. 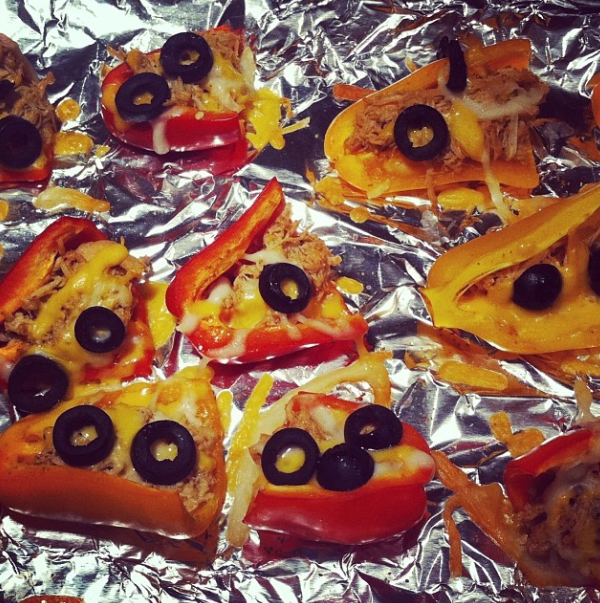 Heat oven to 350 degrees and start cutting your mini bell peppers. Slice off the ends and then slice them in half lengthwise. Remove seeds and ribs and press flat. Place them onto a foil-covered baking sheet. Spoon chicken mixture onto each pepper. Top with cheddar/monterey jack cheese blend and olives. Bake for 10 minutes or until cheese is melted. Sprinkle on cilantro and serve with salsa, guacamole or sour cream. If you try out the recipe, please tag me (@HilaryFlint) and let me know how they turn out! I’m excited to see everyone’s adaptation. My friend Chelsea added a little taco sauce and said it was amazing. These chicken pepper “nachos” are perfect to make for game night or to bring to a party. If you invite me to a potluck – you know what I’m bringing! What is your go-to item to bring to a party? Tags: bariatric, bariatric diet, bariatric recipe, bariatric recipes Mexican, bariatric surgery, chicken pepper nachos, crockpot Mexican chicken, gastric bypass, gastric bypass recipes, gastric bypass surgery, healthy recipes, healthy super bowl snacks, low carb party food, peppers as nachos, protein packed snacks, rny, super bowl food, weight loss, weight loss surgery, weight loss surgery diet, wls. Bookmark the permalink.